MakerBot was going to change the world. It was going to bring 3D-printing, long a product limited to designer offices and workshops, into the home (or at least the garage). But earlier today, under a veil of marketing speak and glitzy videos, the company announced a new focus on commercial—not consumer—products, and in so doing, finally admitted what we’ve all known for a while. No one really wants a 3D printer in their house. That’s a far cry from just a few years ago, when 3D printing seemed on the cusp of something wonderful. It was going to build half your house and maybe your car too. Coverage was breathless, Kickstarters were plentiful, and every nerd’s desk had some kind of PLA-made monstrosity sitting proudly next to a Game of Thrones FunkoPop. But the 3D home printer market has quietly crashed in the intervening years—brought down by extremely low-quality print materials, a painfully long and difficult print process, and worst of all, a complete lack of interest from the general public. The technology’s most stalwart proponent, MakerBot, who Wired once haled as a major cog in the machine of “the next industrial revolution,” has even been forced to repeatedly cut down on staff. The company’s also recently experienced a succession of fleeting CEOs, each with a different plan that was ultimately unsuccessful. In 2013, just five years after founding the company, former CEO Bre Pettis left. His departure coincided with MakerBot being acquired by the commercial 3D-printing focused Stratasys. Pettis was replaced by Jenny Lawton and she was in turn replaced in 2015 by current CEO Jonathan Jaglom. A row of the new MakerBot Replicator Mini Plus. Makerbot’s press conference today was low-key, and the first major product announcement since the pragmatic Jaglom signed on. And his new direction for the company borrows heavily from his parent company’s playbook. Forget the consumer and go after the commercial. MakerBot’s new printers, the professional-focused $2000 MakerBot Replicator Plus and the educator-focused $1000 MakerBot Replicator Mini Plus, are smart steps forward for affordable 3D printing. They’re quieter, faster, and MakerBot has redesigned the software to supposedly make it relatively simple to print. But you still have to have a basic understanding of 3D design and CAD files to get started with the pricier Plus, and the Mini Plus will be leaning on resources built by and produced for teachers to make it a viable investment. For the consumer still clinging to MakerBot’s abandoned dream, there’s little hope. Remember MakerBot’s populist Thingerverse? It’s increasingly seeming like a thing of the past. And maybe Palmer is right. The earliest and messiest and most exciting computers weren’t shipped into homes. They were found in offices and schools. We cut our teeth on finicky tech and then brought it back into the home when it stopped being a chore. One day the 3D printer will stop being a chore. MakerBot might get another crack at our homes. 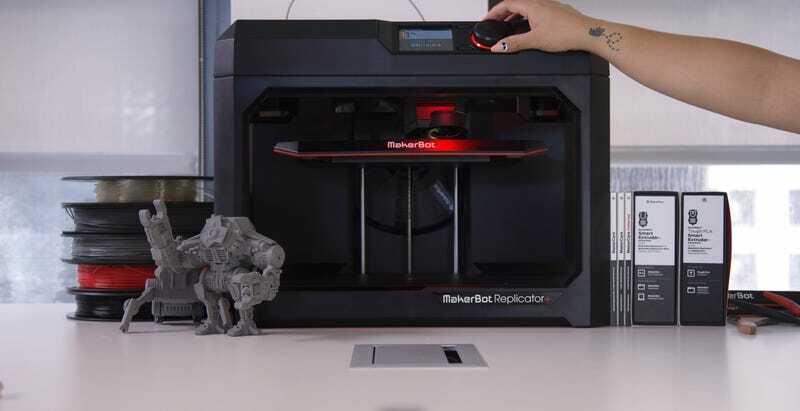 The new MakerBot Replicator Plus.